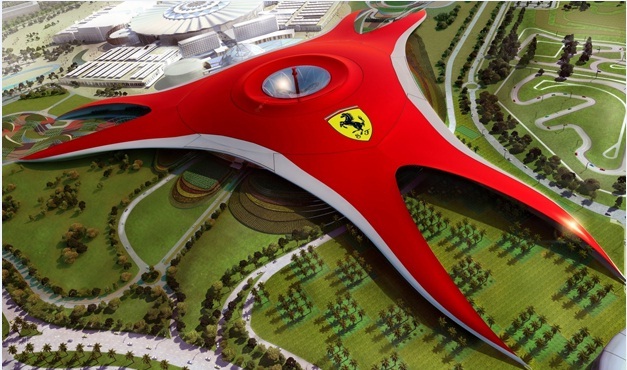 Impress your friends and family with some fascinating facts about Ferrari World Abu Dhabi. 1-The 86,000m² enclosed area of Ferrari World Abu Dhabi can fit 7 football fields in head-to-toe. 2-Ferrari World Abu Dhabi’s total roof area of 200,000m² uses enough aluminium to cover 16,750 Ferraris. 3-If you laid the roof of Ferrari World Abu Dhabi flat you could place 20,100 Ferrari’s side-by-side and end-to-end. 4-If Ferrari World Abu Dhabi was turned upright, it would be the tallest man made structure in the world! 6-The volume of concrete in Hoover Dam could fit inside Ferrari World Abu Dhabi. 7-100,000m3 of concrete were used to pour the slabs of Ferrari World Abu Dhabi, which is 10,000m3 more than what was used for Wembley Stadium in London. 8-Ferrari World Abu Dhabi has the largest space frame structure ever built, with a total of approximately 172,000 members and 43,100 nodes. 9-Ferrari World Abu Dhabi needed 12,370 tons of steel to create its structure. The Eiffel Tower only needed 7,000 tons. 10-The gross footprint area of the plaza level is equivalent to approximately 15 American Football fields. 11-The Empire State Building could be rebuilt in the same time it took to clad the 200,000m² of roof for Ferrari World Abu Dhabi – approximately 14 months. 12-Formula Rossa, the world’s fastest roller coaster, has the same G force one would feel driving in an F1 car and braking at maximum speed. 13-Bell’Italia displays more than 40,000 hand-planted miniature trees. 14-Ferrari World Abu Dhabi includes 1,200 dining seats – enough to feed the entire Park at full capacity in 3 hours.